HOW TO IGNITE YOUR 2018 VISION WITH YOUR WHY? We reviewed in the previous post How to amplify your vision. If you didn’t see it yet, we got a lot of positive feedback you might want to have a look here. Today, we’re going to understand and review how to ignite, or spark again the fire anytime that vision fades away. Why is that relevant to you? There’s a real secret that throws out of balance most people. I promised, if you apply that one secret, that will change your life forever. It’s a promise. There will be difficulties on the road; and some days will be cake walk, some days will be more challenging, and the best way to keep the vision alive is to ignite it with your why. We’ll review why is that.You can check the video here as well. In the end, I will share my why, if that can serve you and maybe inspire you to affirm, confirm your why. First let remind ourselves of two principles we discussed last time. The concept that humans are electromagnetic fields, emitting and receiving frequencies and vibration in/out into the field. We are creating field around us and as within us- Albert Einstein demystified the relationship between matter and field with the new paradigm about the primacy of the field on matter (not matter having primacy on the field). It’s well explained on the video here. Emotions are on/off switches. It’s a simple concept that we overlook most of the time. In other words, we cannot be happy and sad at the same time. That seem obvious, but the reality of understanding this principle make you realized that at any moment we are feeling a certain feeling- and we cannot play ostrich because it’s very distinct feeling – a positive and empowering feeling or a disempowering and negative feeling- Which one would you rather be? Again, here just to clear, I’m advocating to be always positive or always negative but since emotions are indicators it’s important to be aware of them as they dictate the vibration we’re in. Now let’s jump on the secret I want to share. Why is it a secret? Because most people even if they know about it, they don’t know the power of the principles. When we are clear about our vision, it’s a huge step forward and a victory first step. The trick about the way our brain is wired is that, as we get clear with our vision, our brain is trained by default for us to find out what’s missing to get that vision. (like an airplane auto adjusting to get to destination). So, our brain is wired and trained for survival to always look at what’s is missing. However, here’s the secret- We need to move right back and control our focus to what we have (despite what we want to achieve). That’s very tricky BUT this where almost all of us daily lose the terrain on this subtle detail. 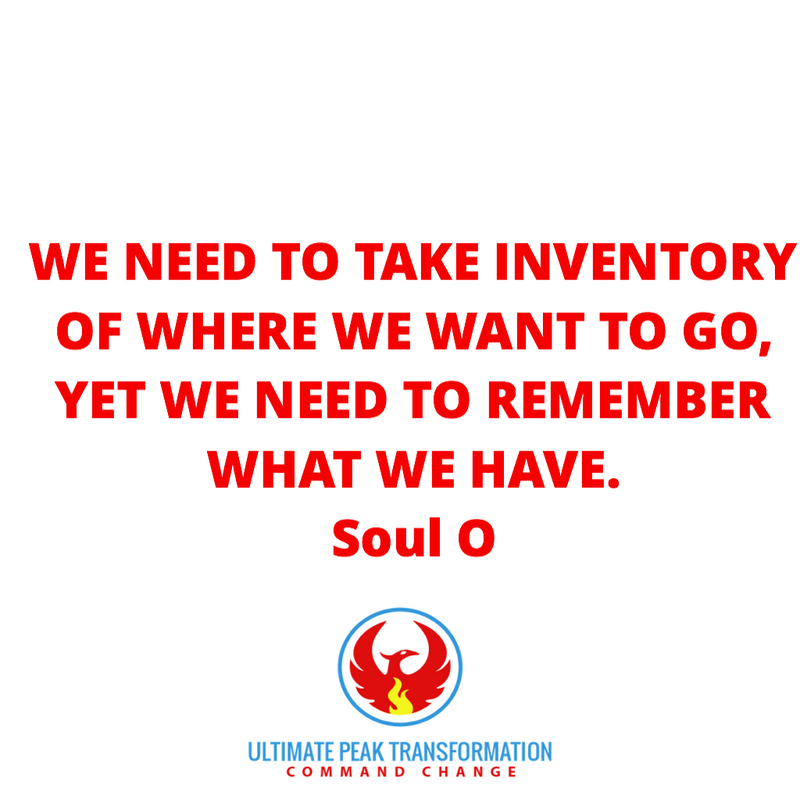 As we exercise our intention- we need to take inventory of where we want to go Yet we need to REMEMBER what we have. Why? Because what we have is our base; it’s the foundation on which we build what is yet to be manifested. We need to come from that place of creation and creativity to become more, to do more and ultimate to have more. That’s the million Dollars secret that is simple but very powerful. One example that I could give is let’s say if one of my resolution was to lose 20LBS this year, and so far, I have lost let’s say 3 LBS; our brain is wired in such way that we want to look at how to lose the remaining 17LBS; in a sense we’re looking and focusing on what we don’t have yet. The correct action is to notice that and right away tune your vibration- be in a joy mode and acknowledge that you have lost already 3 LBS. come from that place of acknowledging emotionally even though mentally you know you have more to go. This is a simple example to illustrate my point about taking control of our intention and focus. Make sure to Not vibrate from the “lack”- the switch is key- ultimately, your brain is showing what you don’t have- it’s telling us we don’t have it. In fact, one quote that is a different perspective is from Neale Donald Walsh- “Gratitude in advance is the most powerful creative force in the universe”- Neale Donald Walsh. I’m curious to read your definition of gratitude-Would you share below what is your definition of gratitude? Now let’s transition to the second big piece of today’s topic on how to ignite our vision when it fades away. The easy button answer is -Connect to Your WHY. The day they are born and the day one’s find out what they are born for. That was a life changing moment for me at that moment as I was in a place of soul searching and I was lost. Now in hindsight, I see the power of that still mainly because your vision and you why are interrelated and connected. As we discussed about field- I would say that your why is the governing field energy of our motivations and actions. If the field govern matter, we better sure that our why is clear and coherent as well. Why your vision is important to you? When you find that, it becomes a pull, No longer a push. Everyday becomes a riveting fulfilling and meaningful day. As yourself why you want this vision manifest? Keep asking deeper (five levels of why like a toddler whom would ask question until sunset) until you get to the point of answer that link you back to contribution to people, humanity. For the main reason that regardless of what you believe, you are here in human from in this plane and your contribution must relate to humanity otherwise there’s no reason to be here in this form. I explain more on that in the video if you want to understand this perspective. In many cases, your why is in the vicinity of your purpose. The truth is that what you don’t use, you lose. This not mere talk, in fact in cellular biology there a phenomenon called-Apoptosis- natural death of a cell based on its non-activity. That’s not an easy answer – There are lot of resources very helpful- One of the consultant that articulates very well this on the business level is Simon Sinek (Start with Why); he illustrates in his Ted Talk how leaders inspire action and companies. One of the best watched Ted talk of all time- I highly suggest to watch it if you haven’t yet. There are two ways to get to that answer I found. One way is to toward the positive and the pull- What excites you- Why? The other way is to look at your past and ask yourself what is deep pain that always you wouldn’t wish on anybody else? Why is that important to you. As you can see I can spend hours talking about this, but let me illustrate with my why, maybe it serves you to elaborate on yours? My pain came from witnessing at young age in Mali, financial “limitations” that I saw percolated into people behavior, some into victim hood or renunciation. At young age, I didn’t know what it was, but deep down inside me, I always felt that there was more to life than what I was experiencing, and in way- I inherently knew that there’s something bigger than I could see. I just could feel it. So, it pains me to see people with elephant might and strength to run away from small cat like if they felt they were little mice themselves. That’s a pain that up today drives me- where- We feel like we don’t measure up sometimes- we feel sometimes that we don’t deserve to be here…it happens to all of us. In fact, part of my journey and revelation was for me to realize after travelling the world that it wasn’t only an African problem, or European problem or an American problem but that’s it’s a humanity problem. It’s that pain that I don’t wish to anybody led me into doing what I’m doing now. On the other hand, what excites me is to see people light up; I get excited to see people in their passion and in their full power with integrity and grace. This is my why in one sentence. It’s To Activate People To Bring Out Their Genius, So that We can elevate together, built and transform our world. If you could time travel and get to your death bed and look back teaching your great grands kids the worth it lesson. Would you be able to tell them, I’m glad I did, because those where the things that matter to me. And it is still worth it. Would you be happy to do even if it was for free? What would happen if you serve only one person- would you think it was still worth it. Make sure your why pass the worth it test. I know it’s a lot of content today and I hope that serves you. Next week is exciting as we start to build on the concept of planning and managing with fears.